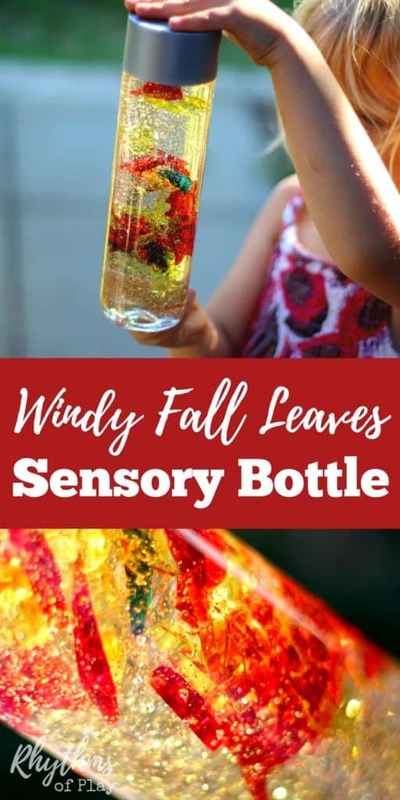 A windy fall leaves sensory bottle for your children to enjoy this autumn. Tipping this fall calm down bottle from top to bottom produces the wind that blows each fall leaf and keeps the autumn leaves in constant motion. 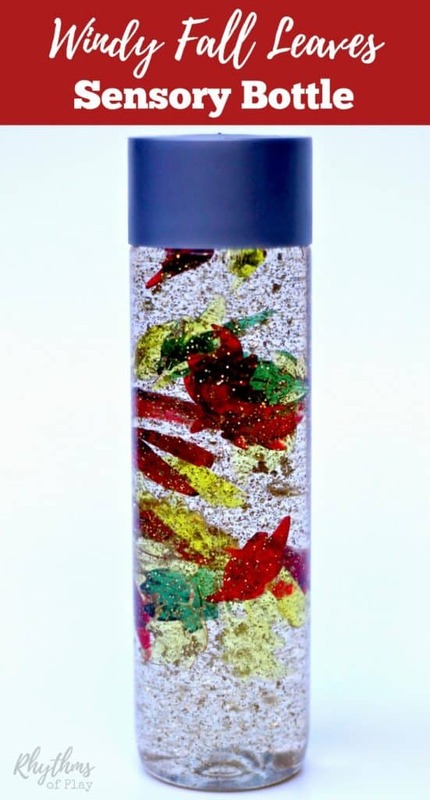 This autumn discovery bottle can also be used to help teach children about the wind and changing seasons. 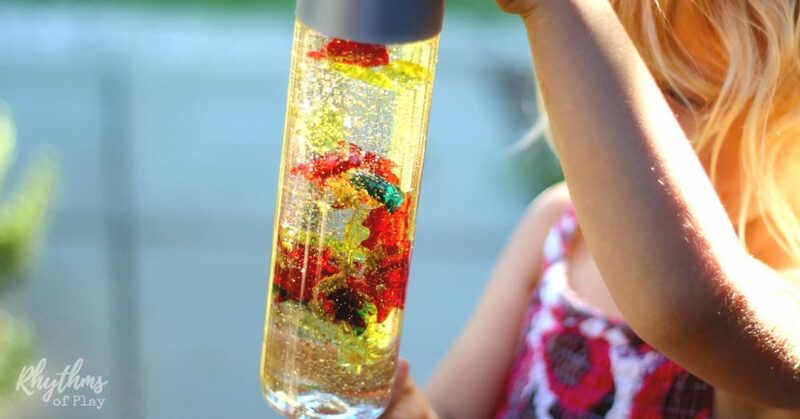 Sensory bottles like this can be used in many ways. They can be used for no mess safe sensory play, a timeout tool, a science teaching aid, and to help children (and adults) calm down and unwind. Gather supplies and follow the easy step by step directions below to make a windy fall leaf calm down sensory bottle for your children. Grab a bottle out of the recycle bin and peel the sticker off. Use Goo Gone to remove sticky residue. Add 10-20 fall leaves. We used mostly red and yellow with a few green autumn leaves. Fill the Voss bottle with 75% corn syrup. 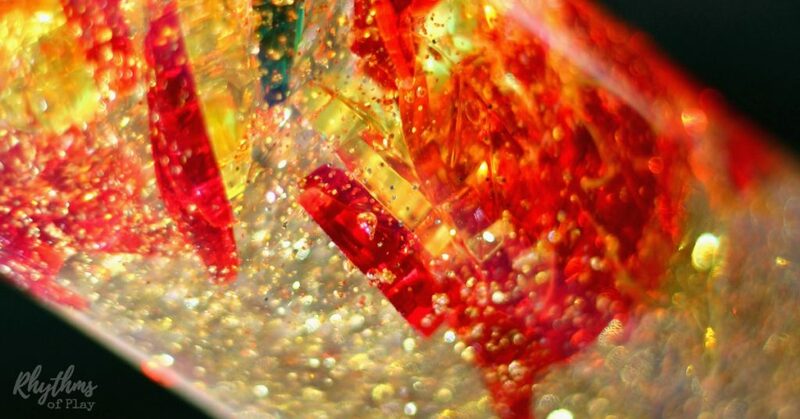 Sprinkle in a few shakes of gold glitter. (Optional) Start with a small amount, you can always add a bit more. Fill the discover bottle up the rest of the way with water. You want to fill it all the way to the top of the calm down jar so there is no air in it. Play with your DIY windy fall leaves sensory bottle for a day or two to make sure you like the way it moves. If you want the autumn leaves to move faster pour some of the liquid out and add more water. If you want the leaves to move slower pour some of the liquid out and add more corn syrup. Want more glitter? Add some more. Easy peasy! To add in a science lesson, explain how the wind moves from an area of low pressure to high pressure. 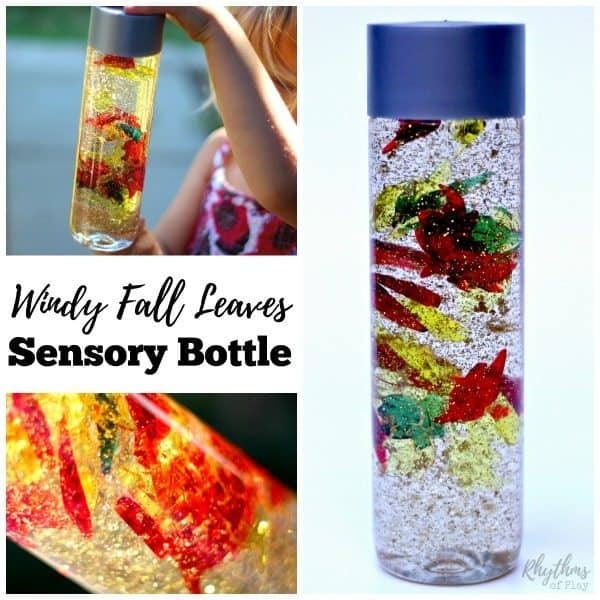 Use this autumn sensory bottle to help teach children about fall leaves and wind as they play! When the bottle is tipped from top to bottom the fall leaves move from top to bottom to produce the appearance of wind blowing from high to low. Learning is fun! Calm down sensory bottles, like this windy fall leaf sensory bottle, are commonly used for safe no mess sensory play, a science teaching aid, and to help children (and adults) calm down and unwind. Discovery bottles are also the perfect way for babies and toddlers to safely investigate small items like these beautiful autumn leaves without the risk of choking on them. This one can also be used to help teach about the wind and changing seasons. To learn more about sensory bottles, their uses, how to make them, and troubleshooting tips check out Calm Down Sensory Bottles 101. Do you have an alternative for corn syrup that I could use? Yes Sarah. You can use clear liquid dish soap or clear liquid hand soap. If you use dish soap you will probably not need any water. Use all dish soap. If you use hand soap you will probably only need 1/4 to 1/2 hand soap, and 1/2 to 3/4 water. I hope that makes sense! Hi, this is Veronika of Toddleratplay.com. Could I use this post in my roundup? I love it. Hi Veronika! I would love for you to feature this post in your round-up, thank you for asking!